The hosts were very nice and helpful. 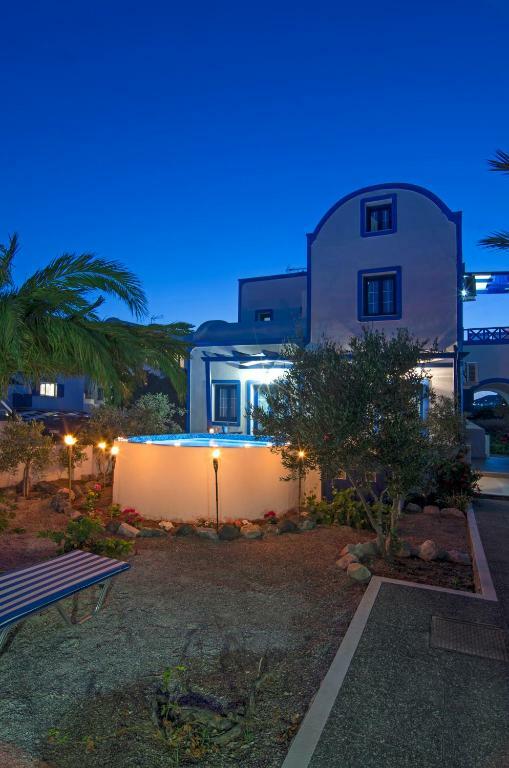 Perfect location 5 minutes walk from the bus station to Fira and the black beach. There is a family tavern in the next building which is very good for breakfast or dinner. Angelos was very freiendly and welcoming. The cleaners are always on time and does a very good job. 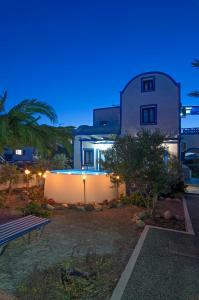 The property is conveniently located a short walk from the beach and restaurants/bars of Perivolos. It was also easy to catch the bus into the main town of Thira which we did most days. The apartment was clean and had a number of amenities available to us. It’s was a 5 minute walk to the black beach and a number of restaurants along the beach. The owner met us on arrival and showed us around the apartment and gave us a lot of advice on how to get around the island and the best places to visit. Loved staying here, great for family with young kids. We named the resident cat Jerry, kids loved this cat even though she wasn’t part of the property. Very close to the black beaches for swimming in the sea. Clean and well prepared room. Estaba muy limpito todos los días. Con cambio de toallas y sábanas. Gracias. 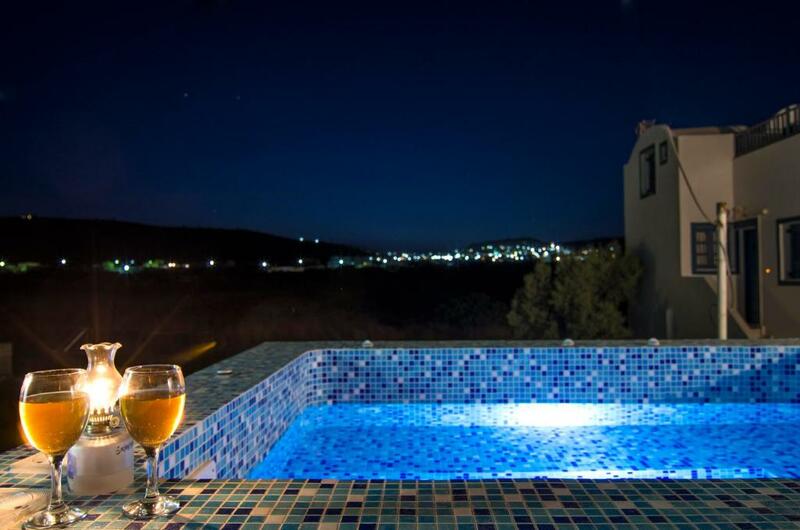 Una terraza amplia y con mini piscina privada. Muy tranquilo el lugar y la playa de perivolos a 10 min. a pie. 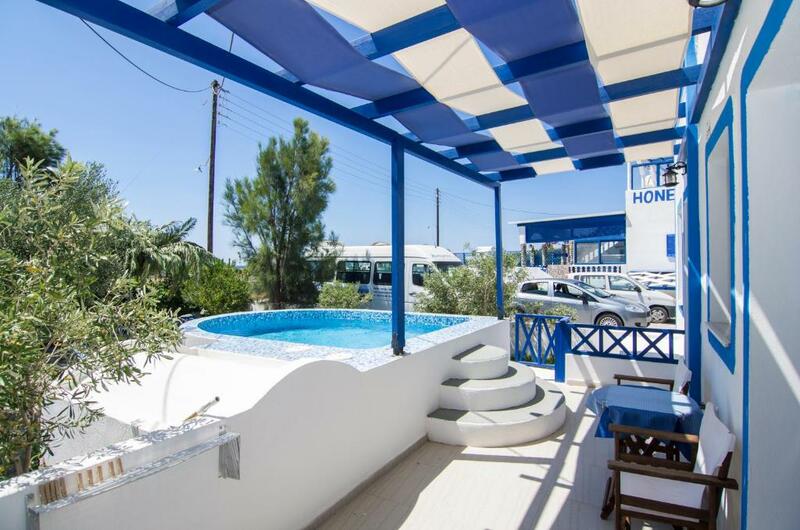 Lock in a great price for White & Blue – rated 8.7 by recent guests! Located in Perivolos, within 1,000 feet from the black sandy beach, White & Blue offers Cycladic-style apartments with plunge pools or hot tubs and views over the Aegean Sea. Beach bars and restaurants can be found within walking distance. The air-conditioned apartments at White & Blue are simply, yet traditionally furnished and open out to a terrace or a balcony. They include a kitchenette well equipped with electric kettle, mini fridge and coffee maker, a dining area and a TV. At 1640 feet, you will find the nearest bus stop and a super market, where you can buy your daily essentials. Santorini Airport is 7.5 mi away. Free private, on-site parking is provided. When would you like to stay at White & Blue? 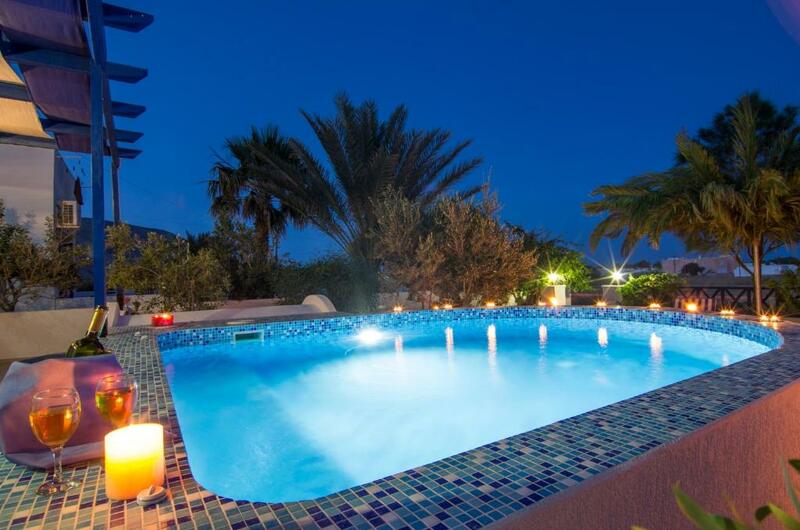 Opening out to a ground-floor terrace with sun beds, this apartment has a plunge pool with hydromassage facilities. It also includes a well-equipped kitchenette, seating area and TV. Please note that the plunge pool is 3.1 x 8.9 feet. 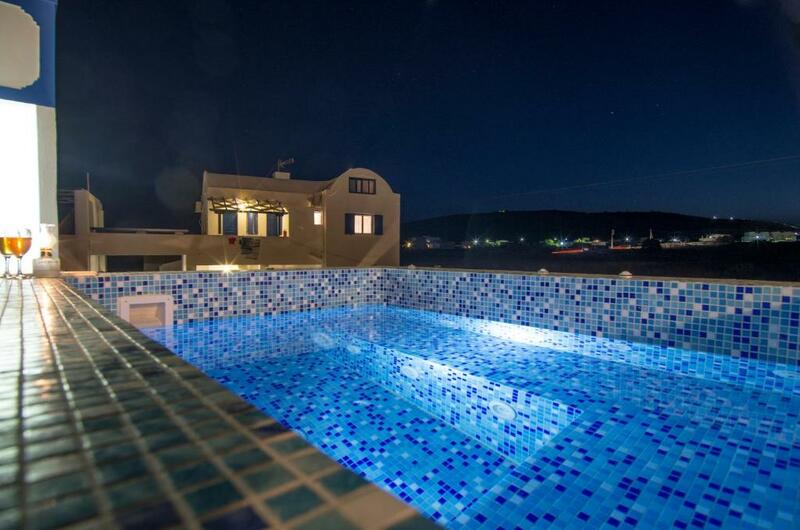 This split-level apartment features a private hot tub and offers views over the Aegean Sea. 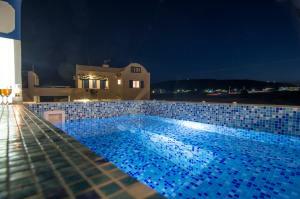 It includes 2 separate bedrooms, a well-equipped kitchenette, seating area and a TV. Please note that the hot tub is 1.5 x 6.6 feet. House Rules White & Blue takes special requests – add in the next step! White &amp; Blue accepts these cards and reserves the right to temporarily hold an amount prior to arrival. White & Blue accepts these cards and reserves the right to temporarily hold an amount prior to arrival. Please inform White & Blue of your expected arrival time in advance. You can use the Special Requests box when booking, or contact the property directly using the contact details in your confirmation. The tab water was salty and it was not possible to make a good coffee. Looks bigger on photos. Not really suitable for family with grown kids as their beds were in the kitchen and everything was very close and no doors between kitchen and bedroom and rooms are so small , so we could not move . Wifi could be better as i could not get to some pages for work purposes. But normal use is fine. You will have to be careful of your head when in the apartment because the ceiling is quite low. Service was amazing, we were well looked after & it was super relaxing. Thank you Angelos we had a great time. Accomodation was true to description. The water from the hotel tap is a bit salty which my wife said was tough on her hair but I think that may be normal for this island. The first floor should have an air conditioner. Angelos was very helpful person.